Vyacheslav Glebovich Kupriyanov was born in Novosibirsk in 1939. His first published works were translations of poetry from German (Ho?Nlderlin, Novalis, R.M.Rilke, Hoffmannstal, B.Brecht, G.Grass, Enzensberger, Hans Arp, Erich Fried) and English (Walt Whitman, Carl Sandburg). Kupriyanov studied technical sciences in the High Navy School in Leningrad (1958 - 1960), and graduated in 1967 from the Moscow Foreign Language Institute (now Linguistic University), section of matematical linguistics and German (1967). 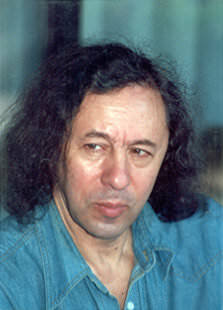 He is a freelance writer, a member of the Moscow Writers Union, and a member of the Serbian Writers Union. Poetry: "First person", 1981 (Moscow), "Life goes on", 1982 (first free-verse poetry published in Russia after the Second Wolrd War); "Homework", 1986; "Echo", 1988, 1989; "Poems", 1994; ?gTHE BEST TIME?h, 2003. Prose: "The shoe of Empedokles" (Novel), 1996, 2000 (Moscow), and short stories (including science-fiction) published in various magazines. In English: "In Anyone's Tongue" (London & Boston: Forest Books, 1992)(dual text, Russian and English). In German: "Moist manuscript" ("Das feuchte Manuskript", Roman), 1991, Alkyon Verlag, "Der Schuh des Empedokles", 1994, 1999; Poetry: "Sober echo", 1986, (LCB-Edition); "Challenge to flight", 1990; "How to become a giraffe"; 1991, 1999; "Monument to the Unknown Coward", (Delp Verlag, 1990); "Eisenzeitlupe", 1996, (awarded first place prize in Su?Ndwestfunk-Bestenliste, 1997); "Short Stories of Eurasia", Alkyon Verlag, 2001. In Bulgarian: "Unknown Wonder", 1987; "The Oase of Time", 2000. In Polish: "The Circle of life", 1986. In Serbian: "Singing lesson", 1987; "Report on an angel" (awarded Library of European Literature Prize, 1988). In Dutch: "The feelers of earth", Leiden, 1988. In Tamil (Sri Lanka): "Modern poems", Colombo, 1988. In Macedonian: "Singing and thinking lessons", Struga, 1999.